Ms Stockton and a fellow National Trust volunteer were taking part in a ecological survey of the park when the arachnid was spotted. She said: "The spider ran away from me twice but with persistence and some luck I caught it. "Upon closer inspection our spider had a conspicuous cardiac mark, a black diamond shape on its abdomen, edged with white that helped us to identify it." The last recorded sightings of the arachnid occurred in Legsheath and Duddleswell, in Ashdown Forest, East Sussex, in 1969. It was also found near Brockenhurst, in the New Forest, Hampshire, at the end of the 19th century. The spider's habitat includes boggy areas with moss, purple moor grass and heather. The National Trust is currently working on an £8.5m restoration project to revive parts of Clumber Park and hope to restore 25,000 hectares of habitat by 2025. 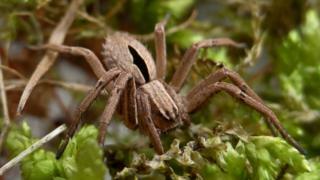 Matt Shardlow, chief executive of conservation group Buglife, said they had almost given up hope of finding the "pretty little spider".